I was expecting a bit of a trying time dining out with our picky 9 year old. He did not surprise or disappoint when it came to that! What I was surprised by though, was the sheer choice of top quality restaurants available in Reykjavik. Who would have believed, on this remote island on the edges of Europe that you would find a culinary destination in itself. There is something for everybody, and I can honestly say that every meal we ate out was superb. It is not cheap to dine out in Reykjavik, if you do some research beforehand though, there are plenty of more affordable options. We found it cost around £25 for a main course in these better value options. No matter where you eat though, the quality of the food and ingredients is excellent. Unsurprisingly, most restaurants have a lot of fish on the menu. Most also have a lamb dish – they eat a lot of lamb in Iceland. You also find whale, dolphin, puffin and reindeer – we tried a whale dish once. It is minke whale – apparently not an endangered species, but the decision to hunt them by Iceland is controversial. 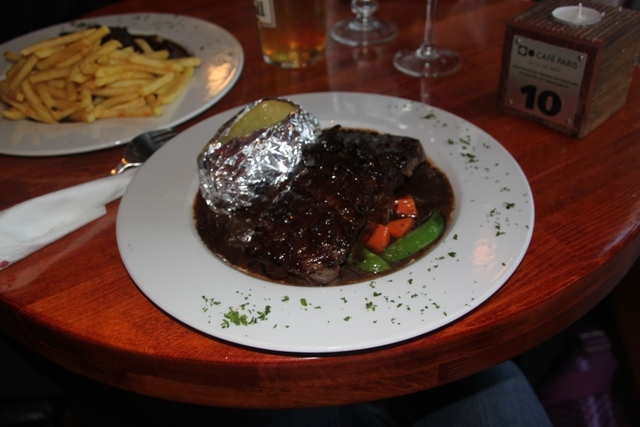 Our whale dish came smothered in pepper sauce with a baked potato on the side. It was nice – I thought it had quite a tough texture and an unusual flavour – definitely salty and sea like and almost a cross between beef and fish. There is a lot of seafood too – lobster in particular. Harkl is something which sounds totally gross, but apparently Icelanders love it. Raw shark meat which is served as an appetiser – not for me!! You tend not to get much in the way of vegetables served with the food – you have to be creative here to get your five a day! Skyr is a bit like yoghurt and is really popular. We loved it – like a mixture of yoghurt, creme fraiche and cream cheese. It comes in lots of berry flavours and is non fat. 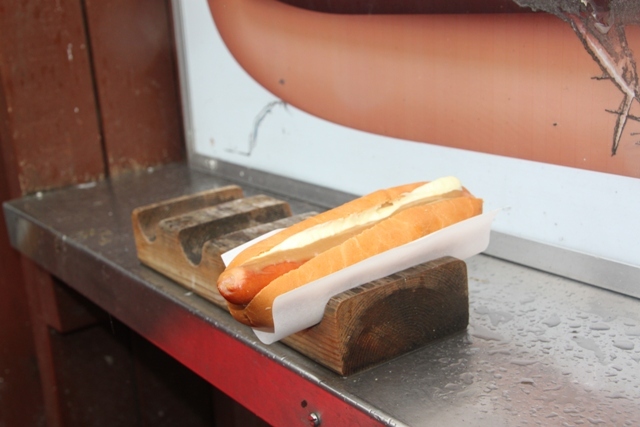 The hot dogs are great. At first I couldn’t see what all the fuss was about – until I tried one, absolutely delicious. They look just like any old hot dog, the meat though is great and they come topped with raw and crispy onions, mayonnaise and ketchup. They are also really cheap, so a great lunch option. Alcohol is so expensive – a glass of wine really drives up the cost of eating out. Also if you want to buy a bottle of wine, you have to go to a specialist wine store, you can’t buy alcohol in the supermarkets. There are also not that many of these stores around. What is great though is that you can drink the water straight from the tap. It is pure spring water. Just make sure you don’t have any warm water mixed in – otherwise you get a stinky, sulphur flavour which is not ideal. We learned quickly to run the water for a while to make sure this didn’t happen. The food was all very healthy, mostly plain cooked but always tasty. Most of the restaurants we ate in also had great children’s menus – the food mainly also suited our picky 9 year old, so would be good for most children. We also loved the coffee shops. There are lots of these but our favourite was Laundromat. What a cool place. They have books in there, arranged by colour and the best coffee ever. It has a great atmosphere and you can linger for ages reading. The coffee shops open late, around 11 ish but stay open until the early hours of the morning. There are next to no international chains in Iceland – this is so great. The coffee shops, restaurants, snack places were all little independents which made a refreshing change for us from the UK, where most cities seem to be dominated by the big names. We loved this. We also loved the Icelandic food. ← Why Is Iceland Great For Families?